Nearly 1000 teams of architects from around the world competed to design an important new building – a “Tall Emblem Structure” that would promote “the new face of Dubai”. The selected winner was the iconic Dubai Frame, and when its doors opened to the public in January 2018, those doors were automatic revolving doors from Boon Edam. Situated in Zabeel Park in Dubai, The Dubai Frame is expected to be a major tourist destination attracting two million people a year. It is an impressive structure, with two 150 meter vertical towers connected by a 105 meter horizontal structure at the top to form an enormous frame. It is positioned in such a way that representative landmarks of modern Dubai can be seen on one side, while from the other side, visitors see older parts of the city. The design of The Dubai Frame was selected as the winner of the ThyssenKrupp Elevator Architecture Award in 2009. The architects were clear in their vision to use the negative space of the frame to celebrate and highlight the development of the past, current, and future Dubai – a metropolis that has evolved from its origins as a fishing village to a modern city full of emblematic structures. According to the website for DONIS, the architectural team who designed The Dubai Frame had this to say, “Opposed to the complexity in architecture, The Dubai Frame is a simple structure, yet with an incomparable presence in the city; it achieves the most with the least and will become the new landmark of Dubai.” DONIS has designed other iconic structures including the Dubai Porsche Design Towers and the Dubai Renaissance Tower. Selecting the public entrances for the ground floor was an extremely important part of the project. The entrances must visually support the impressive nature of the structure; they must be durable enough for the high volume of visitor traffic expected, and they must provide sufficient security, safety, accessibility, and other factors that are vital to the project. When the building opened, the selected entrances were automatic, three-wing TQA revolving doors from Boon Edam. Revolving doors have been a specialty of the company since the earliest years of operation, and have continually evolved through many years of experience and product development. The TQ series of revolving doors is available in both manual and automatic operation, and is versatile enough to cover a wide range of application needs. The doors can be provided in a variety of colors and finishes, from powder coated or anodized metals all the way to stainless steel and even polished to a mirror finish to match or complement the installation. In addition to a collapsible door set for emergency exit, the TQ series offers a variety of night locking options, including a new security night locking capability that works in conjunction with an access control system to allow authorized users to enter during evening or weekend hours. 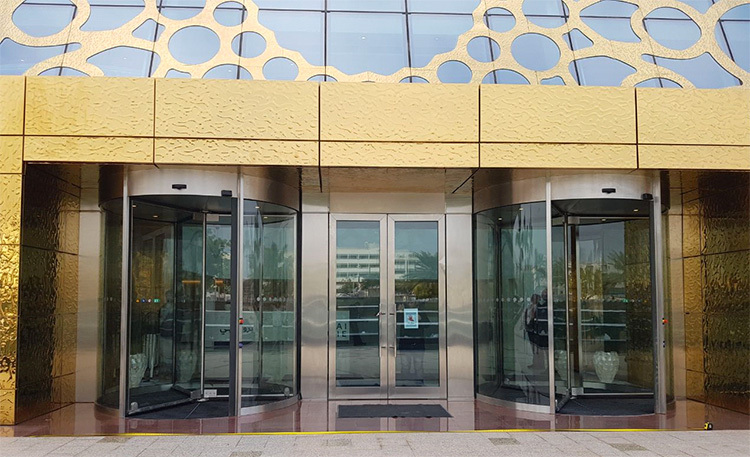 Revolving doors allow for simultaneous two-way traffic, and even support the efficiency of building environmental control systems, making them a great choice for many building entrance types.